Generations of children have roamed the English countryside in the company of Rat, Mole, Toad, and Badger, the immortal animal friends of The Wind in the Willows. From their genesis nearly a century ago as bedtime stories for the author's young son, these timeless tales of friendship amid the natural world have captivated readers of all ages. The adventures begin when Mole, feeling all the restlessness that springtime brings, abandons his burrow to discover the magic of the great river. With the able assistance of Rat, Mole learns to row and swim, and the chums fill their idyllic days with summertime rambles along the river and cozy fireside feasts on crisp nights. The pair take to the open road with the pleasure-loving Toad, track reclusive Badger to his snug lair, and stand together to reclaim Toad Hall from an invasion of stoats, ferrets, and weasels. This memorable collection of stories, now available in an inexpensive and unabridged edition, offers a joyful retreat to a rustic world of wonders. Young readers (and listeners) will want to return again and again to the ageless charm of Kenneth Grahame's childhood classic. About: A perfect first illustrated introduction to the classic animal story for younger readersThe Wind in the Willows has been sensitively abridged and retold to make it suitable for sharing with young children, while retaining all the key parts of the tale of Rat, Mole, Badger, and Toad. About: Mole, Water Rat, Badger, and, of course, Toad of Toad Hall: these characters have captivated children for over a century. About: The Wind in the Willows by Kenneth Grahame is an English classic loved by adults and children alike. About: When Mole takes a break from his cleaning and wanders down to the river bank, he meets the Water Rat and a friendship is instantly formed. About: This book is an adaptation of the classic novel The Wind in the Willows. 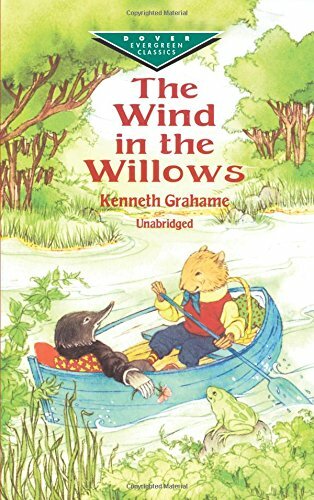 About: The Wind in the Willows (1908) by Kenneth Grahame is a Victorian classic of children's literature, entertaining on a multitude of levels, for the young and old alike, and a commentary on British society of its time. With Rene Cloke (other contributor) | from Gramercy (September 1, 2004); titled "Wind in the Willows"
About: This hardcover edition of the classic tale of THE WIND IN THE WILLOWS has been read and loved by children for generations. With Michael Foreman (other contributor) | from Harcourt Childrens Books (October 1, 2002); titled "Wind in the Willows"
About: The escapades of four animal friends who live along a river in the English countryside--Toad, Mole, Rat, and Badger. About: Ratty, Mole, Badger, and Toad have adventures on the river, wild times in the Wild Wood, and high jinks on the open road. from Bantam Dell Pub Group (June 1, 1999); titled "Wind in the Willows"
About: The Wind in the Willows (1908) is a book for those 'who keep the spirit of youth alive in them'. Har/cas edition from Outlet (June 1, 1989); titled "Wind in the Willows"
About: Dive into this heartwarming classic tale of friendship and adventure "Travel, change, interest, excitement! from Outlet (August 1, 1987); titled "Wind in the Willows"
Deluxe edition from Price Stern Sloan (June 1, 1980); titled "Wind in the Willows"
About: It is an excellent humor book for individuals who loves happiness. With Kenneth Grahame, John D. Lenk | from Prentice Hall (April 1, 1979); titled "Handbook of Microprocessors, Microcomputers, and Minicomputers"
About: The tales of Ratty, Mole, Badger and Toad. from Putnam Pub Group (June 1, 1966); titled "Wind in the Willows"
About: This work has been selected by scholars as being culturally important, and is part of the knowledge base of civilization as we know it. About: A spot of spring cleaning on a sunny English riverbank â so begins the adventures of four beloved friends. About: Kenneth Grahame was a British author best known for writing books for children. About: Kenneth Grahame 8 March 1859 – 6 July 1932) was a British writer, most famous for The Wind in the Willows (1908), one of the classics of children's literature. About: The Wind in the Willows is a children's novel by Kenneth Grahame, first published in 1908. About: Mole, Water Rat, Badger, and the mischievous Toad live a quiet life on banks of the River Thames with the rest of their animal friends. About: When the amiable mole decides to run away from home and his duties in order to enjoy the marvelous summer, he comes into contact with the friendly Rat with which he has many pleasant adventures. About: Alternately slow-moving and fast-paced, the story focuses on three animal characters in a bucolic version of England, and is notable for its mixture of mysticism, adventure, morality and camaraderie. About: The Wind in the Willows is a classic of children's literature by Kenneth Grahame. About: The Wind in the Willos is more than a delightful tale of Mole, Ratty, Badger & Toad, life along the River Bank, & adventures in the Wild Wood. About: The wind in the willows is a classic and much loved tale by Kenneth Grahame. About: The Mole had been working very hard all the morning, spring-cleaning his little home. About: Kenneth Grahame’s wonderful, timeless classic that all kids should know in its complete, original and unabridged form. About: It is spring time: the weather is fine, and good-natured Mole loses patience with spring cleaning. About: One spring day, bored of cleaning, Mole decides to come out of his home into the fresh air, seeing the river for the first time. About: Anthropomorphised animals discuss, endure, experience and personify mysticism, adventure, morality, and camaraderie. About: The Wind in the Willows is a classic of children's literature by Kenneth Grahame, first published in 1908. About: When Mole takes a break from his cleaning and wanders down to the river bank he meets the Water Rat, and a friendship is instantly formed. About: Taking you back to the river bank and a bygone age where Ratty, Mr Toad, Mr Badger and Mole play out their adventures in a countryside of a Britain gone by. About: Classic bedtime story and a bestseller of Kenneth Grahame. About: The Wind in the Willows, by Kenneth Grahame, is one of the most famous works of children's literature. About: The Wind in the Willows became an instant classic when it was first written and remains so even to this day. About: Wind in the Willows, a long-time favorite of many readers, centers around the animal citizens of an English riverbank. About: The Wind in the Willows â Complete Edition - By Kenneth Grahame - A Classic of Children's Literature. About: Generations of children have roamed the English countryside in the company of Rat, Mole, Toad, and Badger, the immortal animal pals of The Wind in the Willows. About: The classic book, The Wind in the Willows by Kenneth Grahame! About: Kenneth Grahame's The Wind in the Willows. About: Imaginative and thrilling, Mike Kennyâs adaptation (the first major stage version to premiere in fifteen years) is a hugely entertaining retelling of the childrenâs classic. About: The Wind in the Willows by Kenneth Grahame. About: The day that Mole abandons his spring-cleaning and sets out to enjoy the sunshine is the start of many adventures. With Kenneth Grahame | 2 edition from Allyn & Bacon (October 15, 2008); titled "Wind in the Willows"
About: Classic / British English This is the story of four friends -- Toad, Rat, Mole and Badger. About: The much-loved classic tales of Ratty, Mole, Badger and Toad. About: Kenneth Grahame was born in 1859 in England. About: Kenneth Grahame (1859-1932) was a British writer, mainly of the sort of fiction and fantasy written for children but enjoyed equally if not more by adults. About: The Mole had been working very hard all the morning spring-cleaning his little home. About: Follow Toad, Rat, Badger, Mole, and their many friends as they are "simply messing about in boats. About: From Wikipedia: “The Wind in the Willows is a classic of children’s literature by Kenneth Grahame, first published in 1908. About: This classic of juvenile literature is compiled of the authorâs letters to his son. About: One of the best-known classics of children's literature, a timeless masterpiece and a vital portrait of an age, The Wind in the Willows began originally in Kenneth Grahame's letters to his young son, where he first recounted the adventures of Rat and Badger, of Mole and Toad--all narrated in virtuoso language ranging from lively parody to elaborate fin-de-siA]cle mysticism. About: A brief retelling of the escapades of four animal friends who live along a river in the English countryside--Toad, Mole, Rat, and Badger. from Allyn & Bacon (January 1, 2001); titled "Wind in the Willows"
About: This is the story of four friends: Toad, Rat, Mole and Badger. from Dover Pubns (June 10, 1999); titled "Wind in the Willows"
from Penguin Uk (June 1, 1999); titled "Wind in the Willows"
About: When Mole goes boating with Ratty instead of spring-cleaning, he discovers an exciting new world and new friends, including Badger and Toad. Reissue edition from New Amer Library (January 1, 1990); titled "Wind in the Willows"
Abridged edition from Price Stern Sloan (October 1, 1989); titled "Wind in the Willows"
About: Follows the escapades of four animal friends, Toad, Mole, Rat, and Badger, who live along a river in the English countryside. from Addison-Wesley Longman Ltd (June 1, 1985); titled "Wind in the Willows"
from Price Stern Sloan (March 1, 1981); titled "Wind in the Willows"
Reissue edition from Ace Books (May 1, 1980); titled "Wind in the Willows"
With Kenneth Grahame | from Gardners Books (March 30, 2009); titled "Wind in the Willows"
About: Ratty, Mole and Badger are firm friends and together they have many adventures with the irrepressible Mr Toad, who, try as he might simply can not help getting into trouble. About: Four animal friends who live along a river embark on a series of adventures. With Kenneth Grahame | from Demco Media (January 1, 1990); titled "Wind in the Willows"
With Kenneth Grahame | from Turtleback Books (April 4, 2006); titled "Wind in the Willows"
With Ernest H. Shepard (other contributor) | from Turtleback Books (March 1, 1989); titled "Wind in the Willows"
With Kenneth Grahame | from Turtleback Books (April 1, 1983); titled "Wind In The Willows"
With Kenneth Grahame | from Turtleback Books (June 1, 1969); titled "Wind In The Willows"